Snow possible Friday night, Saturday – Welcome to Wyandotte Daily! 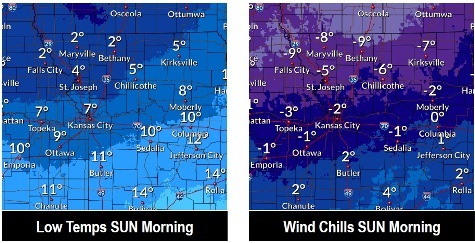 As the winter weather advisory expired at 9 a.m. Thursday, Wyandotte County now is looking at weather in the mid-30s today, with snow possible on the weekend, according to the National Weather Service forecast. On Friday afternoon, rain is likely, then changing to snow and rain around 7 p.m. and snow after 10 p.m., the weather service said. Accumulating snow is expected Friday night through Saturday, according to the weather service. 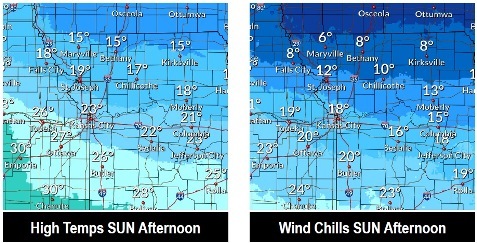 Dangerously cold wind chills are also possible behind this system Saturday night into Sunday, the weather service said. 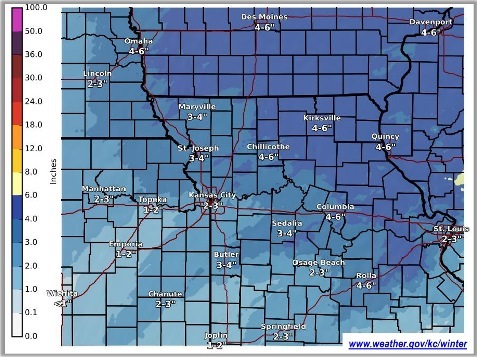 From 2 to 4 inches of snow is possible Friday evening through Saturday evening, according to the weather service. Wind gusts of 30 mph and blowing snow will be possible from 6 p.m. Friday through 6 p.m. Saturday, forecasters said, making travel difficult. Areas of fog remained in Wyandotte County on Thursday morning, and may still be here through noon, according to the weather service. Today’s high will be near 36 with a light and variable wind becoming north northwest around 5 mph, the weather service said. Tonight, the low will be around 30, with a calm wind becoming east southeast 5 to 7 mph after midnight, according to the weather service. Friday, there is a 70 percent chance of rain after 3 p.m., the weather service said. The high will be near 37 with an east southeast wind of 8 to 15 mph, gusting to 21 mph. Less than a tenth of an inch of rain is possible. Friday night, there is a 90 percent chance of precipitation. Rain is possible before 7 p.m., followed by rain and snow between 7 p.m. and 10 p.m., then snow after 10 p.m., according to the weather service. The low will be around 21 and it will be blustery, with a north wind of 14 to 21 mph, gusting as high as 31 mph. A new snow accumulation of 1 to 3 inches is possible. Saturday, there is a 40 percent chance of snow before noon, the weather service said. The high will be near 23. It will be blustery, with a north wind of 14 to 20 mph, gusting as high as 30 mph. Saturday night, it will be partly cloudy, with a low of 7, according to the weather service. Sunday, it will be mostly sunny with a high near 24, the weather service said. Sunday night, it will be mostly cloudy, with a low of 18, according to the weather service. On Monday, Martin Luther King Jr. holiday, it will be partly sunny, with a high near 40, the weather service said. Monday night, there is a 30 percent chance of snow after midnight, with a low of 24, according to the weather service. Tuesday, there is a 30 percent chance of snow, with a high near 31, the weather service said. Tuesday night, there is a 30 percent chance of snow, with a low of 15, according to the weather service. Wednesday, it will be mostly sunny, with a high near 31, the weather service said.